The world is a simpler place now that all our news, TV & radio comes from these handful of corporations. These media companies have completely redefined the meaning of news, relegating it to the pursuit of bite-sized sensationalized stories that feed the hunger for violence and fandom. Under their watch (pun intended) marginalized communities are relegated to racist archetypes and misogynistic tropes devoid of power and agency. They have defined white dominant culture, framed whose stories matter and who is invisible. They are the puppeteers of the Simple Life for a complicated world. They are the BROADCAST CONFERENCE. The four teams vying for your hearts and minds: 1. Fox News, 2. CBS, 3. Sinclair Corporation & 4. Clear Channel. Clear Channel holds an edge in radio stations as it owns more than 850 stations across the country. Search for stations in your city, it’s likely they own a few. FOX owns 27 local TV stations, over 20 newspapers including the Wall Street Journal and of course their prized possession, Fox News. News Corporation knocked the airwaves out of Clear Channel. As the largest cable news network (raking in over 1 million viewers during prime time) this well oiled machine survives to the next round but may not survive much longer as half its audience is 68 and older, starting with the two main honchos at the top Rupert Murdoch & Roger Ailes. In this round CBS (one of the original big three TV Stations) goes up against the relative unknown Sinclair Corporation. CBS comes to the tournament with ownership of 29 local TV stations, over 160 radio stations, and revenues totalling $14 billion dollars a year. You’d think that one of the oldest TV stations would’ve figured out the whole journalism thing by now, but that doesn’t seem to be the case. In Chicago, the local CBS affiliate used the power of editing to portray this young black child as the scary other because it conveniently fit their narrative of gun violence in the inner city. After the Edward Snowden leaks about the NSA, the famed show 60 Minutes produced a lengthy segment which looked more like a PR stunt than a news story. Sinclair Corporation on the other hand, comes prepared with 161 local TV stations in over 78 markets. They’ve more than doubled in size in the last three years and they’ve done it by exploiting a loophole in the FCC’s ownership rules. According to a recent report by Free Press, Sinclair has been creating shell companies to buy up local TV stations. While under the eyes of the Securities and Exchange Commission these shell companies are viewed as part of Sinclair Corporation, the FCC (who has to approve these deals) seems to be looking the other way. We have our first upset! Sinclair Corporation moves on to the finals of the Broadcast Region. While CBS’ longevity in cringe-worthy news might’ve been enough in previous years, the recent wave of media consolidation best embodied by Sinclair Corporation gave it the momentum to pull out the upset. The matchup is very clear. Right-Wing propaganda machine against the Cinderella story of wanna-be media conglomerate. One has a proven track record of awfulness the other is out to make a name for itself (corporations are people after all). 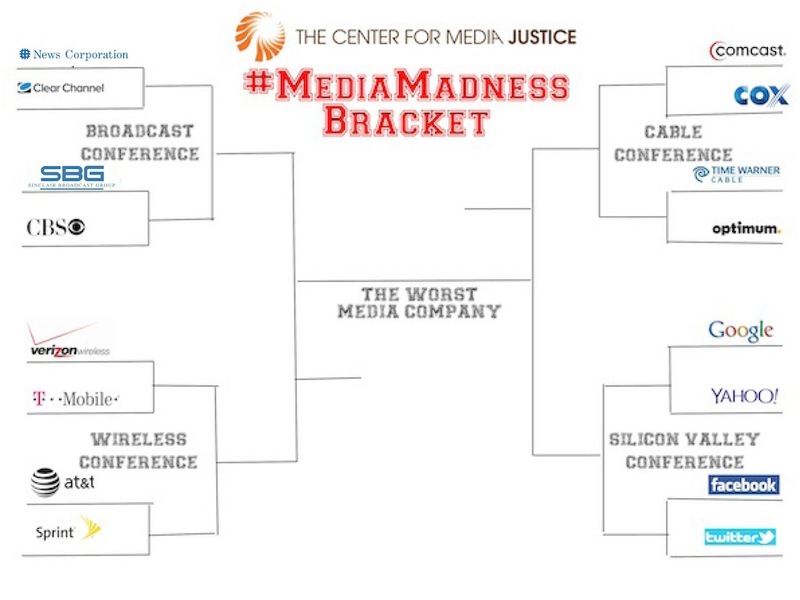 The Cinderella story continues as Sinclair Corporation owns the first bid into the #MediaMadnes Final Four. Sinclair corporation invented a new way to consolidate, exploiting a loophole in ownership rules that the FCC has yet to address. They went from owning just three TV stations in 1991 to over 160 and counting. Why the big spending spree? Since the Supreme Court’s Citizens United decision, Super PACs have poured millions of dollars in local ads during peak political seasons. At the end of 2012 elections local TV stations had generated over $3 billion dollars in ad revenue, ushering in a new era in “big money politics”. Sinclair looks poised to bring that figure up as all the consolidation puts them in prime position to negotiate higher ad fees. Sinclair’s Cinderella story continues in the #MediaMadness Tournament while our local TV programming and local voices turns to pumpkins.